I went over to Hull this weekend for a visit to The Deep and was pleasantly surprised to find a Folk Festival was being held. After wandering around the busy back streets I stumbled upon a building housing the Museum of Club Culture and an artist selling T-shirts with a gallery of his illustrations. 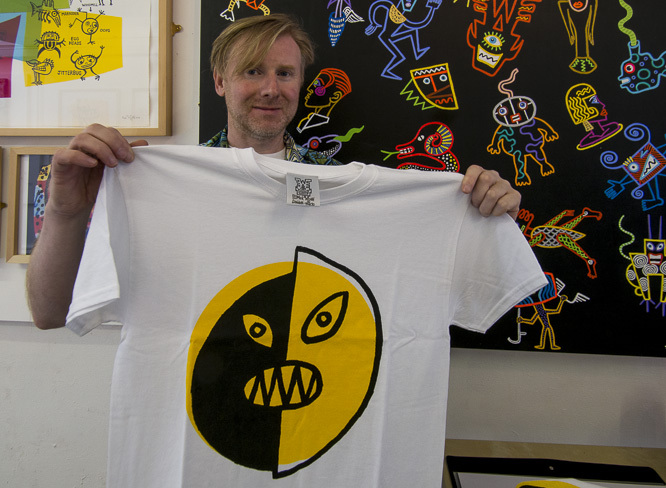 Turned out to artist Mark Wigan who gained recognition in the early 1980’s for his illustrations for NME and iD magazine. I really liked the design of one of the T-Shirts so parted with a tenner and before leaving asked if he’d pose for a photo with the T-Shirt. While in the gallery I noticed a selection of magazine clippings of David Bowie from 70s magazines. Many I recognised as I was a huge fan / collector from 73 to 79 so had most of the material on display. The magazine clippings will be displayed alongside a collection of unseen photos by Peter Hardy taken at the Hammersmith Odeon in the Ziggy exhibition that will run each weekend until 24 October.